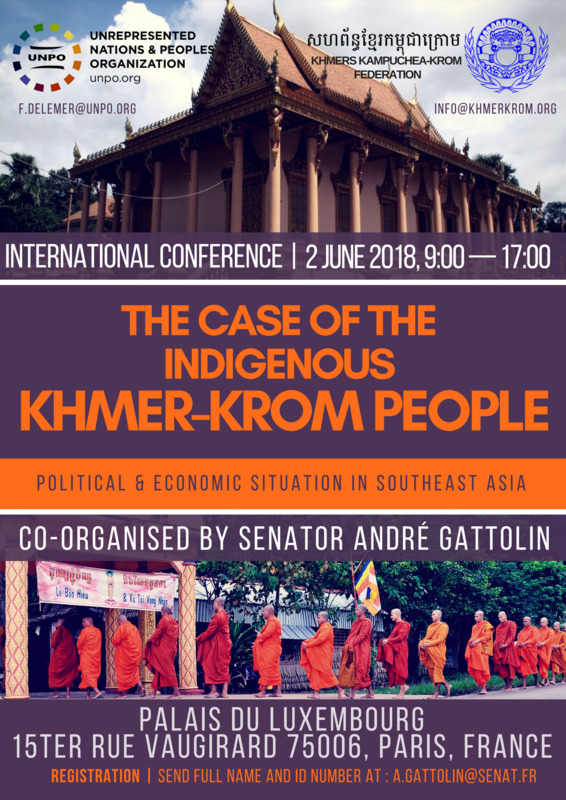 The Khmers Kampuchea-Krom Federation (KKF) together with the Unrepresented Nations and Peoples Organization (UNPO) organise a one-day international conference entitled "Political & Economic Situation in Southeast Asia: the Case of the Indigenous Khmer-Krom People" in Paris on 2 June 2018 from 9am to 5pm to raise awareness of the situation of the the indigenous Khmer-Krom. The conference will be hosted by French Senator André Gattolin and will take place in Palais du Luxembourg, 15ter rue Vaugirard, 75006 Paris, France. Nowadays, indigenous Khmer-Krom communities suffer under the lack of a fair and uncorrupted judiciary system to deal with land claims but also under the excessive use of force by the authorities particularly towards Theravada Buddhist monks. They are also the victims of a poor implementation of their rights to freedom of religion, expression and self-determination, as well as tactics of coercion based on intimidation, imprisonment without a fair trial and torture. The conference will gather members of the Khmer community, scholars, elected officials and members of the civil society. While the morning session will feature panels focussing on contemporary human rights abuses in the Mekong Delta and Kampuchea-Krom, the afternoon session will focus on the international human rights system meant to protect and promote the fundamental rights for the Khmer-Krom. Registration: Send your full name and ID number to: a.gattolin@senat.fr. The press release is attached to this article. Le communiqué de presse est joint à cet article. Introduction: United in the struggle for human rights by French Senator Mr André Gattolin, former Chairman of KKF Kim Thong To and a UNPO representative. 11:00am — 12:00pm Religious Freedom in Vietnam: A Fundamental Right or a Privilege Granted by the Government? Closing remarks by the KKF.